Ensure you keep a record of your IMEI – you will need this if your phone is lost or stolen. Register your phone for free on the Immobilise website. This helps Police to identify you as the owner and return your handset if lost or stolen. Use security or PIN locks to protect your data and prevent the phone being used if stolen. Try to ensure these are not easily guessed, such as 1234, or your birthday. When not in use, never leave your phone unattended in a public place or vehicle. Take particular care of your phone at bars, cafes, coffee-shops, restaurants and music venues – thieves have targeted these venues. If using your phone in public, stay alert and be aware of what’s going on around you. Never reply to spam messages you may receive over SMS or Bluetooth, even to text ‘STOP’. Consider installing a tracker application on your smartphone, it could help trace your device if stolen. If you are unsure which ‘app’ to install seek advice from the manufacturer of your smartphone. If your device is stolen, act quickly – inform the Police and tell them you have a tracker app installed. 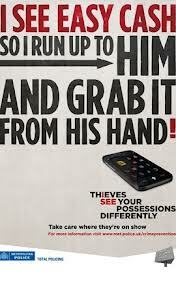 If your phone is stolen, report it to Police and your network. Ensure you have the IMEI number available for the Police. Your network will provide this free of charge. Back up your phone’s data, for example your contact list, photographs. Don’t keep personal information such as bank details, home address or other data on your phone that be used by criminals to commit identity fraud. Be careful when charging your phone on someone else’s computer or at a charge point. A lot of phones combine a data connection with the charger so you could end up having your data stolen without realising it. Don’t be lured into clicking on an unknown link to a web page – your phone could be infected with a virus. Don’t connect to unsecured Wi-Fi networks, for example in a coffee shop or train station, unless you really have to look something up that doesn’t require you to enter personal details or passwords. Quick Response (QR) codes can be scanned by your smartphone to give you access to product information or promotions online. Don’t scan any that look like they have been tampered with or stuck on over the top of packaging code that can leave your phone open to security attacks.